hi there everyone !!! how are you doing? well, the class is a frensh class , and Mrs. Karen is the teacher XD (hope she looks like a teacher from our time cause her clothes look kinda...old ^^') the chalk writing on the wall "la rÃƒÂ©volution franÃƒÂ§aise" means , in the france history, the people revolution in the end of the XVIII century. sorry for my absence ! i'll catch up to it soon ! Waoouch!, this wall is, for sure, a productof a lot of work ; you really didn't choose the easy path when you thought about this wall. the esthetic result isn't really wonderfull so far, because the character are too stretched and that really ruins the scene. also I can see you have worked on the classroom, now you should add some texture on the desks you created, and you should try to use some filter on the overall background to makes it matches with the character. well I guess you understood that, for me, the overall aspect of the wall isn't very good. well that was for the estethic critics. now I must say that I am really impressed by the work you do when thinking about created a wall, when I read your comment it'sreally interesting to see you really try to tell us a story troughout a wall; which isn't a simple task! see ya around, I hope I wasn't too harsh. The classroom is nicely done :) you really put alot of effort into it!!! If your main light comes from the windows, the shadows should be like the Teacher's..to the right. 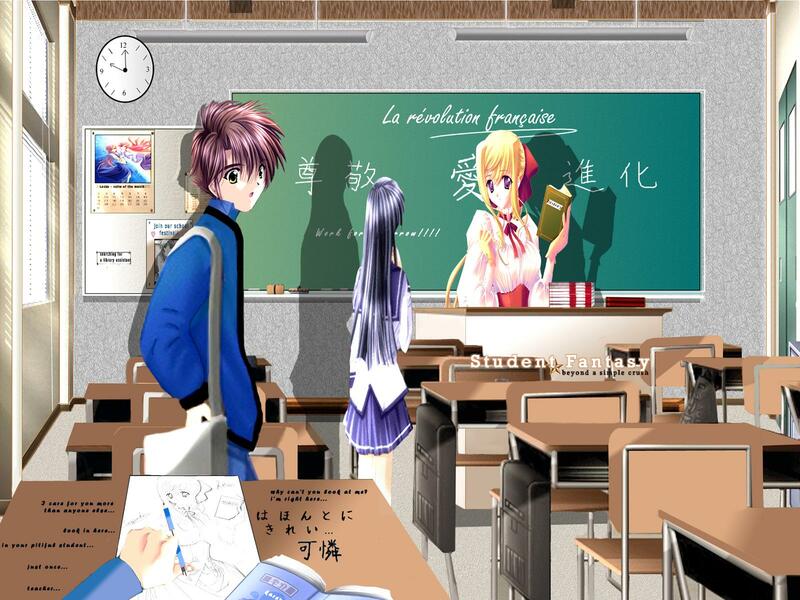 The blue haired girl's shadow is larger and to the left...which suggest that the light for her comes from the lower right. For the guy, his face's lighting shows that the light comes from the right, but the shadows show that the light come from the front. ^^;;;;; I'm not sure if i'm saying things right, but the light and shadows were the first things that came to mind when i saw the wallpaper...maybe you can change the shadows??? the extracting could be improved as there's jagged edges and the character scan look somewhat low quality. try to clean it up or re-cg it if it's reallie bad. and the 2 gurls at the front, the look somewhat distorted and squashed. nonetheless, overall you did a good job with it and there's still room for improvements :) keep it up ! 3. extract the images aliitle more clearer, because they need to fit into the wall more than a regular. but dont take this as me picking on you... i really like the concept.... :) keep it up!! for improvements :) keep it up ! wow thats amazing, everything you said you did to it!! This is really really really good! fantastic idea i love it! Very interesting. Lots of detail on the textures.